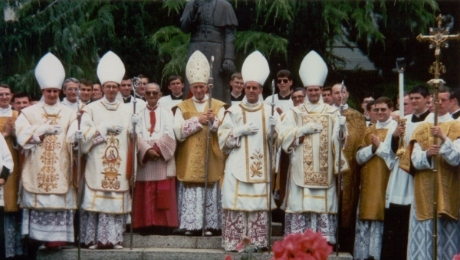 25 years later, Bishop Fellay recalls his reaction and emotions when Archbishop Lefebvre choose and consecrated him a bishop, as well as the impact of the 1988 Consecrations and what it means for the SSPX and Tradition today. Angelus Press: What was your initial reaction when you learned that Archbishop Lefebvre had chosen you to be one of the priests to be consecrated? Bishop Fellay: My first reaction was to think there must be others better than me; if possible, let this chalice pass from me! My second reaction was for my fellow priests, my brothers in the priesthood, "pro fratribus" because it is obvious that it is a big cross. It is a question of dedication for the others. Angelus Press: Can you recall your emotions and state of mind on June 30, 1988, after having received consecration from the hands of the archbishop? Bishop Fellay: I don't recall much about my own feelings or emotions. What I remember was how the whole congregation was electrified. The atmosphere was absolutely electric. I've never seen that in my whole life. This I do remember. It was during the ceremony as well as after; a great joy, nothing else. It was overwhelming. Angelus Press: In his Spiritual Journey, Archbishop Lefebvre describes a vision he had in the Cathedral of Dakar. Can you discuss how the 1988 Consecrations would seem to be a fulfillment of that vision? Bishop Fellay: Amazingly, I would say that I don't even make the connection between both. In fact, I don't think there is any. I don't think the measure of having bishops is directly related to the work itself. It's only a survival measure. It's not the essential of the work, which is to form and build priests according to the heart of Jesus. This is the main thing. It is true that without bishops, we would not have priests, but it was definitely not the essential element of the work. It is essential to survive but not for the nature of the work. Of course with all the developments we had in our apostolate and the situation of the Church the question of the bishops has to be seen in a new light! Angelus Press: Archbishop Lefebvre attempted to underline the extraordinary nature of his decision to consecrate as well as distinguishing it from a schismatic act by emphasizing that he did not attempt to transmit any delegated episcopal jurisdiction but only the power of ordination. Some have over the past 25 years expressed disapproval of the election of one of the bishops as Superior General, arguing that such act suggests a jurisdictional claim as a bishop. Can you explain how such an argument is incorrect and elaborate how fulfilling the role of Superior General does not involve any claim to delegated episcopal jurisdiction? Bishop Fellay: First, why did the archbishop not, at the time of the consecration, want a bishop to be Superior General? It was expressly to make it easier to deal with Rome. If the Superior General was a bishop, he would be under the "penalty" of Rome, which would make discussions more difficult than if it were, for instance, Fr. Schmidberger at the time. This was clearly limited to the circumstances; it was not a principle. It was a question of prudence. It was not a direct exclusion of a bishop being Superior General in the future. But we must distinguish two kinds of jurisdiction. There is a normal, ordinary jurisdiction of a superior general over his members and there is ordinary episcopal jurisdiction. As bishops, we have no ordinary jurisdiction right now, but as Superior General, I do have the other kind. They are not the same. Angelus Press: Do you have a particularly important memory of the archbishop you would be willing to share? Bishop Fellay: On the one hand, his simplicity and common sense, and on the other hand, his very high vision of things. It was always supernatural. He always looked at God. It was clearly the case that he was guided by prayer, the Faith, and union with God. For him it was normal and obvious that someone had to be, in ordinary actions, always united with Our Lord. Angelus Press: How do you cultivate into your seminaries and priests Archbishop Lefebvre’s unique spirit of priestly piety, doctrinal soundness, and counter-revolutionary action? Bishop Fellay: First of all, we try to put the seminarians in contact, as far as possible, with Archbishop Lefebvre himself: his voice, his teaching, his books, etc. We have tapes of his conferences to seminarians. The French here have an advantage! But we are working on translating these so that all seminarians may have them. In English, some have already been collected in book form: They Have Uncrowned Him, Priestly Holiness, and The Mass of All Time. Second, we try to fulfill and apply the means he himself gave to us in the seminaries: the organization, the plan of studies, and lectures prepared by him, for instance. He determined their set up, and how they are structured. For example, our philosophy and theology is based on the teachings of St. Thomas, as the Church has recommended. The Acts of the Magisterium is a class in particular desired by the archbishop, which teaches the encyclicals of the great popes of the 19th until Pius XII in their fight against the introduction of Enlightenment principles into the Church and society. We still follow this with great fruits. Angelus Press: What have been the most significant changes, good and bad, for the Society since the 1988 Consecrations? Bishop Fellay: I don't know whether there are so many changes. We are getting a little bit older, although we are still a young congregation. But we now have elderly priests, which we did not have in 1988. This is an external change, you may say. We had 4 bishops then and now we have 3. This is again a change, but nothing major or essential. We have more houses in more countries but this is not so much change as a normal development of the work. We remain faithful to the line Archbishop Lefebvre gave. If we look at the last few years, in fact, Archbishop Lefebvre said in 1988 that Rome would come to us in 5 to 6 years after the consecrations. It lasted almost 24 or 25 years, and obviously things are not yet ripe. The changes Archbishop Lefebvre expected in the Church, the coming back, are not yet there. But obviously, if they continue the way they go, the destruction will continue, and one day they will have to go back. And that day they will come to us again. On another hand, look at what has happened in recent years: the admission that the Old Mass is not abrogated, the lifting of the "1988 excommunications" and the influence in the Church that we have never had before! And this is not to mention the growing critique of the Council, even in Rome, outside of Society circles which is a relatively new phenomenon on this scale. Angelus Press: Can you describe the works and services that have occurred during the past 25 years that would have been impossible without the Consecrations? Bishop Fellay: It's simple: since the consecrations, the SSPX bishops have ordained more priests than were at the consecrations in 1988. Therefore it is clear that the bishops were necessary for the growth of the work of the Society. We would be a dying Society without the bishops. It is vital for the continuation of the work. There are also the confirmations, the making of soldiers of Christ to fight for God and His kingdom. Finally we cannot deny this influence on the whole Church so that Tradition may regain its rights. Angelus Press: Some critics of the Society point to Ecclesia Dei Communities none of which, with the exception of the case of Campos, have bishops of their own. They argue that the Consecrations were therefore unnecessary since these communities have existed without their own bishops. How does the contrast between the history of the Society and the Ecclesia Dei Communities over the past 25 years demonstrate even more clearly today than in 1988 the correct judgment of the archbishop that a bishop of and from the Society was necessary not merely for her survival but for preservation of her complete mission? Bishop Fellay: First of all, all the Ecclesia Dei members understand that if we would not have had bishops, they would not exist. Directly or indirectly, they depend on the Society's life. That is very, very clear. And now the fruits of their apostolates are totally subjected to the good will of the local bishops. They drastically limit any solid desire to establish traditional Catholic life by limiting the possibilities of the apostolate in that direction. They are obliged to mix with the novelties of Vatican II, the world, and the Novus Ordo. This is the great difference between the Society and Ecclesia Dei groups. I do see that some Ecclesia Dei groups are getting closer to us. This is definitely not all of them, though. Angelus Press: The archbishop had exhausted himself over the years prior to the Consecrations by traveling the world as the only traditional bishop (with the exception of Bishop de Castro Mayer who limited his sphere of activity mostly to his own former diocese.) As a result he chose to consecrate four bishops rather than simply one. The number of traditional faithful has grown in the past 25 years, yet sadly the number of bishops in the Society has now been reduced to three. Are 3 bishops sufficient to carry on the work of Tradition? Is it necessary to consecrate more bishops now? Bishop Fellay: Since 2009, in fact, we have only been working with 3 bishops. Obviously, it is working. Thus, it is clear that with 3 it still works. So there is no urgency or extreme need to consecrate another bishop. We certainly do have to ask ourselves the question concerning the future even if right now there is no necessity. My answer is very simple: if and when the circumstances which led the archbishop to make such a decision present themselves again, we will take the same means. Angelus Press: Although Archbishop Lefebvre always maintained the desire to arrive at a peaceful relationship with the Roman authorities, the consecrations resulted in a new phase of hostile treatment and persecution of the Society by the Roman authorities. You have tried over the past decade, at least, to find a resolution of these hostilities and persecutions in a manner which in no way compromises the principles of the Society's mission. So far at least your efforts have not succeeded in a resolution. Why do you think, notwithstanding your good will, the efforts have not succeeded thus far? Bishop Fellay: First of all, I would point out that the initiative of normalization came from Rome, not from us. I did not make the first move. I tried to see if the situation was such that we could go ahead while keeping our identity. Obviously, it is not yet the case. Why? The authorities still stick to the dangerous and poisonous principles which were introduced in the Church at the time of the Council. This is the reason we cannot go along. I have no idea how much time we will need, or how many tribulations we will have to suffer through, until then. Perhaps ten years; perhaps more, perhaps less. It is in God's hands. Angelus Press: Do you remain open to receive contacts from Rome and in particular the new Holy Father? Bishop Fellay: Of course, I do remain open! It is God's Church. The Holy Ghost is still above to move beyond the obstacles put in place after Vatican II in the Church. If Our Lord wants to make things straight, He will. God knows when it will happen, but we must be always ready for it. A complete and true solution can only come when the authorities work again in that direction. Angelus Press: What signs can we watch for to determine if a conversion to Tradition has occurred, or is beginning, among the Roman authorities? Bishop Fellay: It is very difficult to say where it will begin. We saw with Pope Benedict that it was primarily the great sign of the liturgy and perhaps some other efforts which were less strong. These happened in the face of strong opposition. Obviously, it didn't make it through to what we see now. But it will definitely have to come from the head. Something may come from below, from bishops, priests and faithful in the Novus Ordo who want to come back. I think this tendency has already started, though not yet very large. It's not yet the mainstream, but it is definitely a sign. Profound change must come from above, from the pope. It could come from several sides, but definitely it will mean to put God and Our Lord Jesus Christ in the right place in the Church, in the center. Angelus Press: Assuming a conversion from the top, in Rome, how could the work of restoring the entire Church proceed? Bishop Fellay: It's very difficult to say. Right now, if things do not change, it could mean inner persecution and large fights on the inside of the Church as it happened in the time of Arianism. If something else happens, for instance, if there was a persecution and then afterward, the pope came back to Tradition, the situation could be totally different. God knows what kind of a blueprint He will follow to bring the Church back on track. Angelus Press: What can be done to hasten such a return to Tradition? Bishop Fellay: Prayer and sacrifice! Everyone should follow one’s duty of state, encourage devotion to the Immaculate Heart of Mary, and pray the rosary. Concerning the rosary, I am open to a new Crusade. Angelus Press: What do you say to those who claim you planned (or still plan) to compromise on the Council and with the post-Conciliar Church? Bishop Fellay: That is pure propaganda from people who wanted to split the Society. I don't know why they have these ideas. Obviously they used the very delicate situation of last year to accuse the superior of things he never did or had the intention to do. I never had the intention to compromise the Society. Nevertheless, ask yourself: to whom does it profit to see the Society divided, if not to the enemies? Those who divide the Society with their dialectic, they should reflect on why they do what they do. With this, I mean Bishop Williamson and the priests who follow him. Angelus Press: Looking back over the past year, is there anything you would have done differently? Bishop Fellay: Oh, certainly. We are always wiser after the battle. I would have emphasized more what I have always said, though I didn't think it was necessary to emphasize: in whatever kind of an agreement, there would always be a condition sine qua non that we are not going to compromise. There is no way. We stay as we are. This is what makes us Catholics, and we want to remain Catholics. I certainly would have, and in fact, have already, improved communications. I was paralyzed by the leaks. I would do it otherwise now. Angelus Press: Beyond relations with Rome, what are your hopes for the next 25 years for the Society and the Church? Bishop Fellay: That in these next 25 years, we will see the return of the Church to her Tradition so that we may see a new blossoming of the Church. Angelus Press: What would you recommend to both clerics and lay faithful as appropriate means of honoring and commemorating this 25th anniversary of the Consecrations? Bishop Fellay: To honor our dear archbishop, to try to imitate his virtues, his beautiful humility, his poverty, his prudence, and his faith. Further, study the teaching of Archbishop Lefebvre in order to understand the principles that guide us: the love of Our Lord, the Church, Rome, the Mass, and the Immaculate Heart of Mary. An Angelus Press interview published in May-June 2013 issue of The Angelus.